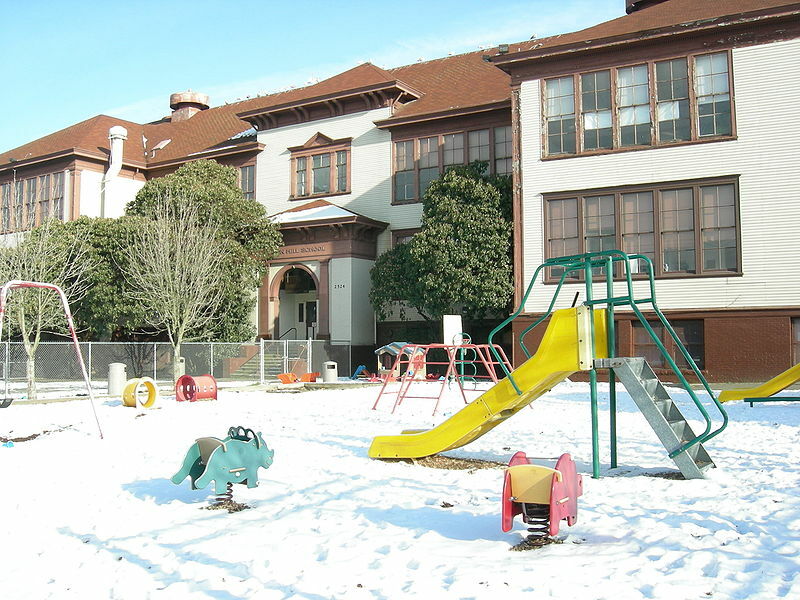 Earlier this week the City Council approved Opportunity Fund grants for two Beacon Hill parks, Lewis Park and the Santos Rodriguez Memorial Park (El Centro de la Raza Play Area). The grants were awarded for the amounts recommended earlier by the Levy Citizens Oversight Committee: Lewis Park was awarded $260,000 for reforestation, and Santos Rodriguez Memorial Park was awarded $350,000 for improvements to revitalize the park and increase public awareness and access to the park space. 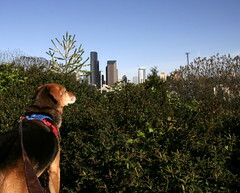 Rocco enjoys the view from Lewis Park. Photo by Valerie Craig in the Beacon Hill Blog photo pool on Flickr. The Lewis Park Reforestation application has been selected for the final draft list of the Parks and Green Spaces Levy Opportunity Fund. A public hearing will be held October 25 at Miller Community Center (330 19th Avenue East). The Opportunity Fund Oversight Committee will be looking closely at community support for each project before selecting the final 15 proposals to recommend for funding. The hearing starts at 7:00 pm, but, we’re asking everyone to be there at 6:30 to show their support. Please let me know if you can make it… we’re going to be making up some signs for everyone to hold. The idea is for a few people to actually speak and everyone else stand up to show the support for Lewis Park. If you are unable to attend the hearing, you can send an email showing your support of Lewis Park to Susanne Rockwell — susanne.rockwell@seattle.gov. The Final Draft List for projects to receive funds from the Opportunity Fund has 15 projects with 3 alternates. The Oversight Committee will be making its final selection based on community support for the project. Friends of Lewis Park has asked for $260,000 to hire contractors to restore the steep slope areas of Lewis Park (volunteers cannot work in this area). Combined with the ongoing volunteer work, these funds will enable the restoration of all 5.1 acres of the park and provide North Beacon Hill with a safer, more livable neighborhood. As a Natural Area, Lewis Park will be transformed into an Urban Forest for generations to enjoy. Please email/call if you any questions. Here is a link to the list of the 15 finalists and three alternate projects. Please note that one of the three alternates is also on Beacon Hill: the Santos Rodriguez Memorial Park at El Centro de la Raza. 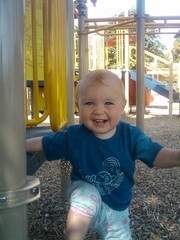 Final project recommendations will be made by the Levy Oversight Committee to the Parks Superintendent on December 6. Two projects in North Beacon Hill, the Walker Street Park and Orchard and the North Beacon Hill Central Park, have scored in the top ten citywide among applications submitted for 2010 Parks and Green Spaces Levy Opportunity Fund grants, with the Walker Street Park achieving the status of “Staff recommended.” Eight North Beacon Hill projects were submitted in April to be considered for the grants. They were among 95 applications submitted city-wide, competing for $7 million in this funding cycle. This week, Parks and Recreation released the results of the initial staff evaluations of the projects. You can read the criteria they used for scoring the projects here. The Walker Street proposal is one of only 12 applications chosen as “staff recommended,” with the comment “Staff preference for funding in this neighborhood.” This does not guarantee that the proposal will be funded, but it is a good sign. All the other North Beacon projects, including the North Beacon Hill Central Park, are listed as “Lowest staff-ranked projects.” The Central Park is the highest-scoring project to be ranked as “lowest staff-ranked,” but the comments about it indicate some reasons for this: “Possible conflicts with Neighborhood Plan and City Council desire for increased density here.” Additionally, this would be a high-cost project, as would the Walker Street Park, and both are located in the same sector. On Monday, June 28, the applicants have the opportunity to present their projects at the Levy Oversight Committee meeting. In September, there will be a public hearing on project prioritization and funding recommendations, and in January 2011, project funding recommendations will be given to the Mayor and City Council. The Council is expected to approve the recommendations in March, and the projects can begin implementation shortly afterward. Thanks to Andrew Abian for the tip!